Cape Florida Lighthouse on Key Biscayne. Photo of the Cape Florida Lighthouse. Located in Bill Baggs State Park on Key Biscayne Island. A view of the harbor andd cruise ships from the lighthouse in Key West Florida. The scenic beach and lighthouse at Key Biscayne Florida. On the shores of the Atlantic Ocean. Ported at Key West Florida on Mustin Street. Cape Florida Lighthouse on Key Biscayne, land view. Photo of the Cape Florida Lighthouse, land view. Located in Bill Baggs State Park on Key Biscayne Island. From site: The Cape Florida lighthouse is one of the most celebrated landmarks owned by the State of Florida. Cape Florida Lighthouse staircase on Key Biscayne. Photo of the stairwell within the Cape Florida Lighthouse. Located in Bill Baggs State Park on Key Biscayne Island. 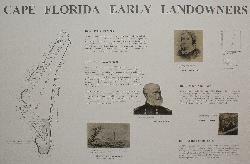 A display at Key Biscayne National Park, showing the early landowners of Key Biscayne. From site: Pedro Fornells was granted 175 cultivable acres on Key Biscayne by the Spanish government in 1805, and the land sat largely untouched until almost 20 years later when an heir of the Fornell family sold the tract of land to Mary Ann Davis, a London born American woman, for $100. Photo of sunrise approaching the Key West pier from the Carnival Freedom cruise ship. Skyline of Fort Lauderdale, taken from the Carnival Freedom cruise ship, leaving the Port Everglades terminal. Time of day was late afternoon, in February. from site: A beach is a geological landform along the shoreline of an ocean or lake. It usually consists of loose particles which are often composed of rock, such as sand, gravel, shingle, pebbles, waves or cobblestones. The particles of which the beach is composed can sometimes instead have biological origins, such as shell fragments or coralline algae fragments. from site: Ancient Roman lighthouses are among the best preserved, and best known examples of lighthouses from Ancient History. A famous example is the Tower of Hercules in A Coruña, Spain, and there is another at Dover, England which still stands to about half its original height. It must be remarked that lighthouses existed since the Hellenistic period, but it is mainly the Roman ones which have survived. from site: In early time people set fires at the edge of the water to warn boats of dangerous rocks and shores. The Egyptians were the first people to build lighthouses to use light to guide ships. In Egypt in 283 the Egyptians completed the tallest lighthouse ever built. It guided ships for over 1,500 years and stood 900 feet tall. Lighthouses were also constructed by the Phoenicians, Greeks, and the Romans. A park is a protected area, in its natural or semi-natural state, or planted, and set aside for human recreation and enjoyment, or for the protection of wildlife or natural habitats. It may consist of rocks, soil, water, flora and fauna and grass areas. Many parks are legally protected by law. Key Biscayne is an island located in Miami-Dade County, Florida, United States, between the Atlantic Ocean and Biscayne Bay. from site: The United States of America (also referred to as the United States, the U.S., the USA, or America) is a federal constitutional republic comprising fifty states and a federal district.